One of the key acquisitions that Bentley announced at its recent Year in Infrastructure (YII) 2018 Conference was LEGION for pedestrian simulation. I find the concept of pedestrian simulation extremely fascinating, because unlike other simulations such as structure or energy that are grounded in scientific properties and natural laws—for example, the rate of flow of an inanimate object in a specific context, as in computational fluid dynamics (CFD), can be calculated with exact precision—pedestrian simulation is dealing with human beings who have a mind of their own and are unpredictable. I know this for a fact because I am one! How, then, does pedestrian simulation actually work? How can acts such as walking, or even driving, by human beings, be predicted? I was motivated to delve deeper into this topic after attending a presentation on LEGION at the YII 2018 conference by the founder and head of the company, Douglas Connor. Not only did I learn more about LEGION, how it is currently being used, and the plans for its future development, I was also able to get a better understanding of the technology of pedestrian simulation by researching it from a broader perspective and delving deeper into how it is implemented. Let’s start by looking at the field of pedestrian simulation software in general and then at LEGION in particular, including the science behind it. The need for pedestrian simulation software is a no-brainer. In fact, this is true for most events that we need to understand better to determine how to design in response to them. Thus, we need crash simulations to better determine how to design automobiles to minimize injuries and casualties, earthquake simulations to better design our structures to withstand them and minimize damage, traffic simulations to improve traffic flow, weather simulations to improve forecasting, energy simulations to design more sustainable and comfortable buildings, and so on. In the same way, simulating pedestrians can help building designers streamline foot traffic, avoid congestion, control crowds, and improve evacuations in the event of an emergency, especially in large and heavily trafficked public buildings such as airports, train stations, stadiums, and concert halls where people congregate (Figure 1). In recent years, we sadly also have to design buildings to improve egress in the event of a bomb threat, mass shooting, or terrorist attack, and not just for an emergency like a fire or an earthquake. Figure 1. 3D simulation of egress from a stadium in LEGION. Given the growing importance of the need to design buildings to better address the mobility needs of the people who use it, the use of pedestrian simulation software is becoming critical. In addition to LEGION, one of the most well-known pedestrian simulation tools in AEC that I am aware of is MassMotion from Oasys, an update on which was provided in AECbytes Newsletter #76. Another tool is SimTread, a plug-in to Vectorworks for analyzing pedestrian traffic flow. SimTread has been recently been expanded by its Japanese developer to simulate whole city evacuations during natural disasters like tsunamis and earthquakes, as I reported in my 2017 article, Flood Forecasting Technology. We are also starting to see pedestrian simulation in an infrastructure design tool like InfraWorks, which added a “mobility simulation” capability in its 2017 release to analyze not just the movement of vehicles in a proposed road design but also pedestrians, bikes, taxis, buses, and other modes of transportation (see AECbytes Newsletter #80). In addition to these applications, I also discovered other pedestrian simulation tools I was not previously aware of including Pedestrian Dynamics, AnyLogic, SimWalk, and PTV Viswalk. All of these are highly specialized applications offering dedicated solutions for specific building types such as airports (Figure 2), train stations, stadiums, concert venues, etc. However, they are not yet integrated with BIM, which means they cannot simply be plugged into the BIM workflow to perform the simulation. The design for the simulation—referred to as the “infrastructure” in Pedestrian Dynamics—is either created using a drawing or modeling interface that comes with the application (Figure 3), imported in a non-BIM format such as DXF, or created by the developer as an additional service performed on a consulting basis. Figure 2. Dedicated pedestrian simulation within an airport model using SimWalk. Figure 3. The integrated modeling and viewing tool in Pedestrian Dynamics. Being specialized applications, these are typically used for large and complex projects by some of the world’s largest construction firms, developers, and owners/operators. 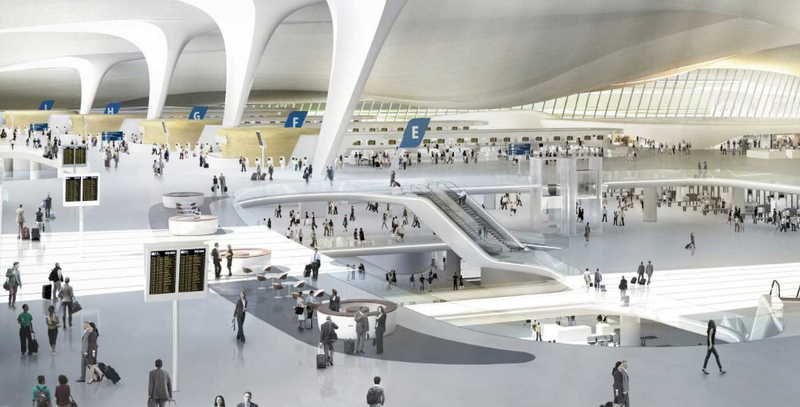 For example, SimWalk’s client roster includes SNC Lavalin, Jacobs, Parsons Brinckerhoff Asia, T.Y.Lin International, Aéroport de Paris, Zurich Airport, and several railway and transport agencies; Pedestrian Dynamics has been used in various projects including Little Caesars Arena in the US, Public Transport Terminal in Utrech in the Netherlands, World Exposition Shanghai 2010 in China, Brisbane International Airport in Australia, and Arena do Gremio in Brazil; PTV Viswalk was applied to simulate pedestrian facilities at Lausanne Main Station in Zurich in Switzerland, and for the assessment of passenger flows in Amsterdam Central Station in the Netherlands; and Anylogic’s published case studies of its pedestrian simulation software include optimizing passenger flow at Frankfurt Airport, crowd control of tourists at the Eiffel Tower in Paris, and reducing passenger wait time at the Transmanche Terminal of the Gare du Nord in Paris, which is the hub of the passenger transport across the English Channel linking Paris to London. 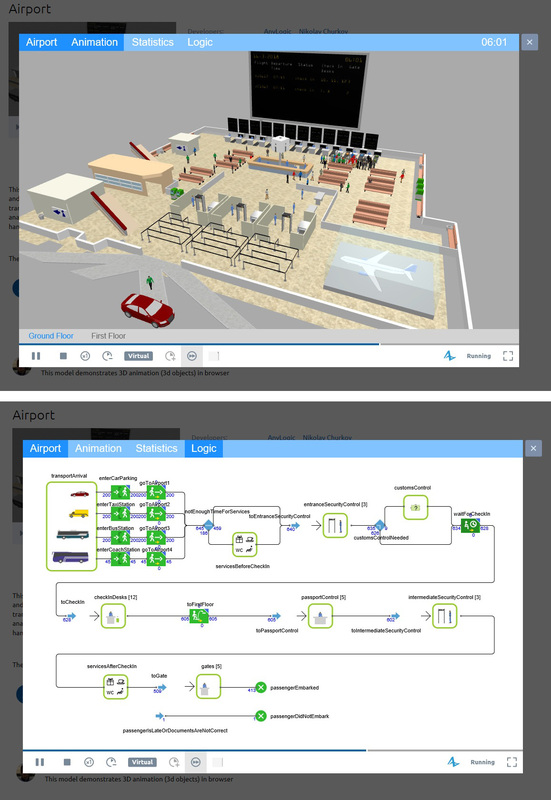 Anylogic also publishes examples of actual simulation models that can be run and the underlying logic studied, such as the one shown in Figure 4 of an airport terminal showing both the 3D simulation as well as the underlying logic, making it very helpful to understand how the simulation works. The example shown in Figure 4 is an actual simulation of the international departure terminal of Koltsovo airport, Yekaterinburg, Russia. The simulation duration is one day and night. Passengers can arrive by four types of transport: bus, fixed route taxi, personal car, or coach. The simulation shows them arriving and subsequently going through security controls, customs control, check in, passport control and gate control. The flights schedule for the simulation is read from an Excel file. This kind of simulation helps to analyze the dependency between airport services on the one hand and registration time and personnel utilization on the other hand. Figure 4. Example of a simulation of an airport terminal in Anylogic. The simulation can be seen both graphically as well as in the form of a flowchart. Given the preferred use of Bentley’s solutions for large building and infrastructure projects such as airports, train stations, stadiums, etc.—exactly the kind of projects that can benefit from pedestrian simulation—the acquisition of LEGION makes a lot of sense and it seems like a natural fit in Bentley’s product portfolio. While LEGION is currently a stand-alone application that requires the building geometry for the simulation to be imported from CAD/IFC files to which objects such as stairs, escalators, turnstiles, etc., can be added from a built-in library, it can, over time, be integrated with Bentley’s main BIM application, AECOsim Building Designer. This would allow pedestrian simulation to be performed within the model itself, as part of the overall BIM process, similar to energy simulation, without requiring the modeling and the simulation to be performed in a separate interface and the results then applied to the design to improve pedestrian flow and safety. A little bit of history. LEGION was founded in 1997 in London, and the company was initially providing pedestrian simulation using in-house models to clients on a consulting basis. One of its earlier clients was the Sydney Organising Committee for the 2000 Summer Olympic Games. Recognizing that transport planning was critical to the success of the Games, LEGION was brought in as a consultant for crowd simulation services. The software itself was launched in 2003, and one of Britain’s largest railway ventures, Crossrail, soon became a customer. It is currently used by some of the world’s major transit organizations to improve pedestrian safety and operational efficiency (Figure 5) and has demonstrated use cases for stadiums and airports as well (Figure 6). It has also been used on every Summer Olympic Games since the Sydney Olympics in 2000. Figure 5. 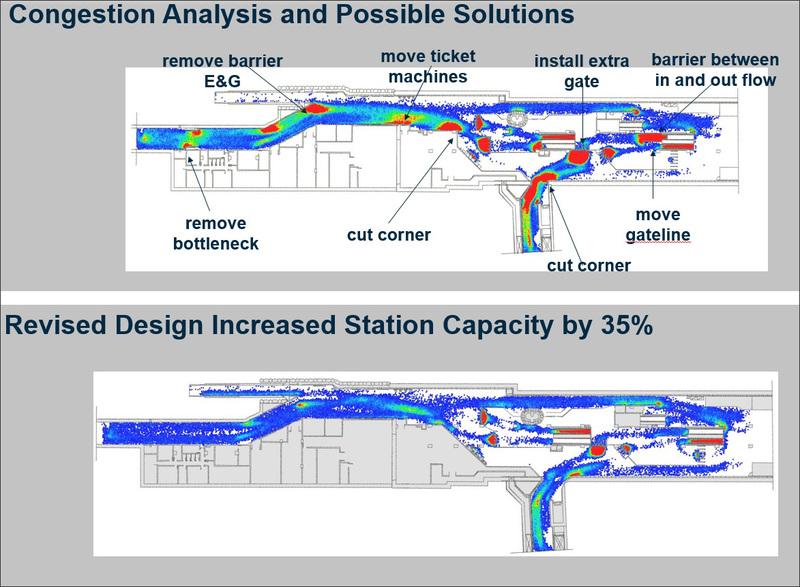 Congestion analysis done with LEGION and possible solutions identified to reduce congestion and increase station capacity. Figure 6. 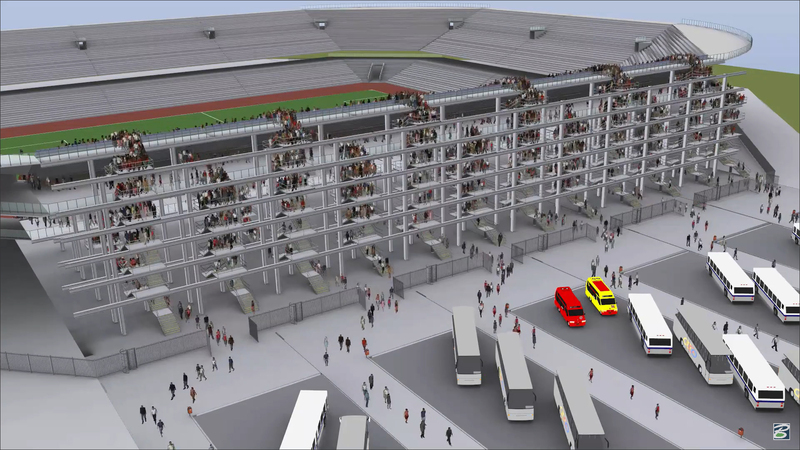 Use cases of LEGION pedestrian simulation in a stadium (left image) and an airport (right image). The science behind the pedestrian simulation in LEGION was actually developed at an associated research organization called the MAIA Institute. MAIA carried out a comprehensive research program for the study of pedestrian behavior, using video techniques to collect empirical data of pedestrians from venues around the world, which was then systematically analyzed. The results were combined with mathematical modeling to create the simulation engine that drives LEGION. One of the key characteristics of this engine is that it uses “microscopic pedestrian simulation,” which means that every pedestrian in the model is created as an individual with specific behaviors rather than with generic behaviors. Thus, the simulation can have different types of pedestrians—men, women, and children, of different ages and nationalities—who behave differently in different scenarios, for example, commuters, tourists, and spectators. Since these behaviors are based on the systematic observation and measurement of the real-life behavior of a large quantity and variety of people in different contexts, the simulation aims to depict reality as accurately as possible. Also, since the simulation microscopically accounts for individual decision-making, the crowd formations and patterns of movement that emerge naturally also aspire to be similarly realistic. Going forward, LEGION would like to expand its capabilities to enable multimodal simulation as well, which means being able to simulate pedestrians using additional modes of transportation such as bicycles, cars, buses, etc. in addition to walking. Another future vision is multiscale modeling, where the application is able to simulate many more people—its current limit is around 100,000—for use in larger venues, entire neighborhoods, and eventually cities. It would also like to simulate other kinds of pedestrian activities in addition to walking such as sitting or strolling. And eventually, it would like to have real-time capabilities where the simulation captures current conditions in a space and can be used to anticipate potential problems and defuse them in advance. This would likely require GPS data from the smartphones of the people in a space, similar to how GPS data is used to track and analyze traffic data in real-time. Going back to the unpredictability factor that I mentioned at the beginning of this article, this is what makes pedestrian simulation far from being straightforward. While there are some basic rules that can be applied—obviously, people can’t crash into one another or into other objects—even some rules that you think might be basic and universal are actually not that simple. For example, people would typically avoid walking too close to another person; however, the size of this “personal bubble” would vary depending upon the type of space and the situation. People are more likely to be packed like sardines in a concert arena than an airport; and of course, if there is an emergency evacuation of any sort, in any space, any concept of personal space goes out the window. Also, while people would likely find the shortest route to get from Point A to Point B, especially in a train station or an airport, the simulation also has to account for people who take detours, lounge around, stop to chat with others, go get a coffee, and so on. Thus, while pedestrian simulation draws on principles from physics and mathematics similar to other kinds of simulation, it also has to rely extensively on psychology to understand and predict human behavior, individually as well as collectively, in different settings. While the technology of pedestrian simulation—and the science behind it—is undoubtedly fascinating, it is also important to take a step back and ask if it is really necessary. After all, aren’t architects trained to design spaces such as airports and train stations to account for the large numbers of people using them? What about all the rules of thumb, heuristics, and design standards of the kind we find in reference books like Architectural Graphic Standards? If architects can rely on these and their own experience and expertise for common guidelines such as the dimensions of risers and treads in a stair, for example, without needing to see a simulation of a person climbing a staircase, doesn’t the same hold true for more specific guidelines as well? Do architects really need to see the pedestrian simulation of a space in order to be able to design it? Of course, whether architects would rely on this kind of simulation as a design tool or not, pedestrian simulation technology would definitely be helpful to validate a design for owners and operators, enabling them to test it for safety, operational efficiency, and other criteria. The larger and more complex the project, the more likely it is that pedestrian simulation will be used for it, and it might soon become as commonplace as the renderings or animations of design proposals that are currently used for client presentations. Also, technological advancements such as machine learning—where video footage can be used to train algorithms to identity patterns for better predictions—should greatly help to improve the accuracy of the simulation. In the course of researching this article, I watched videos of several pedestrian simulations, and even after getting a better understanding of the technology and the science behind it, I have to say that I still found it fascinating, almost magical. And there is nothing like seeing yourself as just one of those ant-like creatures that is a part of the crowd in a simulation to bring on an existential crisis of sorts!